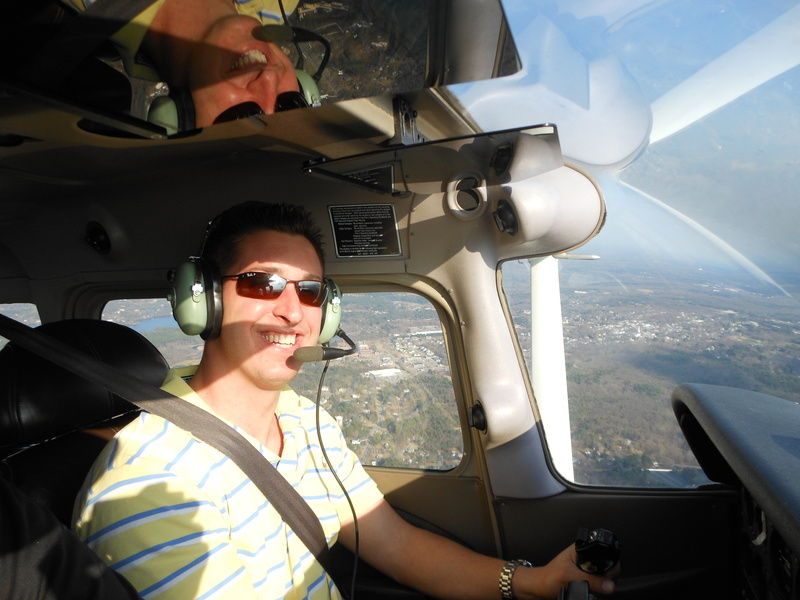 3 Things Every (Flight Instructor) Pilot Needs to Know About… Giving a GREAT Demo Flight! Small fish that live in the ocean have to swim in schools to prevent large predators like sharks from literally eating them up… Similarly, flight instructors have to learn to give exceptional demonstration or discovery flights (commonly referred to as demo flights). While flight instructors aren’t worried about big planes eating up their little Pipers or Cessnas, they do have to eat themselves. This requires working (flying) to make money, which requires a student load that will provide the instructor enough potential revenue… While the little ocean-dwelling fish and flight instructors are very different they share the need to survive and thrive! A demo flight is a student pilot’s first aviation experience (in the majority of cases). This is the beginning of their journey to the hobby or career of aviation. A demo flight isn’t just another 1-hour or 2-hour slot in an instructor’s schedule, it is so much more. During my time contributing to the management of a flight school I was (and continue to be) a proponent of an instructor not being overloaded with demo flights on any given day. A demo flight requires a lot from an instructor and it is the instructor’s duty to provide an amazing experience for the customer. Don’t agree? Well, okay, but first consider that successful demo flights are what transitions a one-time flight school visitor to a regular customer! Granted some clients are one-hit-wonders just wanting to check it out and get some pictures, then move on to the next challenge. But with an honest sales pitch, an enjoyable environment and a fun expereince almost any first time flyer can be converted. After all, they did just take the toughest step, walking into the flight school, a place extremely foreign to non-aviators. In my opinion, once someone has overcome the anxiety to enter the unfamiliar flight school, they have indicated their interest and want to be ‘sold’ on learning to fly! Now I want to take a look at three critical components to each and every successful demo flight. While the particulars can be debated, these are tried and true keys to success! Let the student fly, but don’t make them do it the whole time! Early on in my flight instructing I would allow the first time flyer to have their hand on the control yoke as I preformed the takeoff (we only need one on the yoke! ), then around 1,000′ I would transition control of the aircraft over to them. Barring anything unforeseen they would do most of the flying until about a mile out on the 45-degree entry to the downwind leg of the traffic pattern. After that it was time for them to sit back and enjoy the view. I’d also add, “And remember, these little ones land differently than the big ones you fly in for vacation, so you’ll know when we’re on the ground.” This was my way of setting myself up… If the landing was not my best or firm they’d think it was good and if the landing was nice and smooth, they’d be extremely impressed! A few years back Cessna sent out materials to all of their Cessna Pilot Centers, one of which I was teaching at, at the time… In their materials and in a presentation they provided for the instructors at our school, they insisted that first time flyers not be on the controls for takeoff and instead enjoy the view. Their reasoning was that the first takeoff was a thrilling expereince and the new student shouldn’t miss it. In my opinion, not making the first takeoff was missing it, but I gave it a shot… I never fully settled on which way was better and it often depended on my initial impression of each first time flyer as to whether I’d invite them to have their hand on the yoke during the first takeoff or not. One thing I did notice was that if the student returned for a second lesson and they had not participated in the first takeoff, this was the ‘big thrill’ of a second lesson, once I incorporated that, I felt better about it. It is important to remember the time we live in… It is a digital media age! Social media is a multi-billion dollar industry and it is because of the organic growth/use of these channels. Your first time flyers are similar to you and I, they likely have a Facebook, Twitter, Instagram or Snapchat account. Quite possibly all of the above, which you should view as organic ways to market yourself through your first time flyer! If nothing else, the new student definitely has a cell phone, tablet or computer in need of an epic background, say one of them at the controls of an AIRPLANE! I was very lucky while teaching, Gillette Stadium, home of the current Super Bowl Champion New Emgland Patriots was about 5 miles away. What better landmark to fly by during a first flight lesson, even non-Patriots fans (I know, they exist, it still shocks me…) are impressed by the structure as well as the companion mall, Patriot Place! Especially when departing Runway 32, it was very easy, takeoff, depart on the upwind following Rt. 495, then a turn northbound, a circle or three around the stadium and then head south down Route 1 to the practice area. Add in a picture of them, with their hands on the controls and Gillette Stadium out the window, and the picture is going viral amongst their friends… Many of whom will ask about it and that’s when the new student pilot tells all their friends about the great demo flight they just had with Mr. or Mrs. CFI at The BEST Flight School. This is how a savvy flight instructor not only capitalizes on making the expereince fun for their new student but also leverages that new student to do some grassroots marketing for them! This picture from 2013 when my first time flight student was the Massachusetts Secretary of Transportation, hung in the Massachusetts State House for the duration of his time in that post… Now that helped to spread the word about me and my flight school! You never know where a cool picture will end up, or who will have the chance to see it! It is equally important to give the new student a chance to maximize the marketing materials they may produce on their own. What I mean by this is, give the student a couple of opportunities to take out their phone (which you should instruct the first time flyer to place somewhere that is easily accessible during the flight before you even start the engine) and record some video or take some pictures! These pictures and videos will serve as constant reminders of their amazing expereince and be the encouragement the first time flyer needs to transition from newbie to regular customer! Make sure they get plenty of pictures and get one of them with the airplane after you land, remember everyone only gets one first flight lesson! Smile, compliment and make sure it is fun for them! That is ALL that matters, literally! Paying attention to the first timer keeps you ahead of the game! It’s also a good idea to watch the student to see how they are doing, if they start to “white knuckle” the controls, sweat or lose a little color, it’s probably best to scale back the climbs, turns and descents and at least trend back towards the airport. It’s also a good idea to ask a few “get to know you” questions… This can be beneficial for a couple of reasons: 1. It will provide you with a way to show you listen and take an interest in your students (read: customers) during the second lesson when you bring the topic back up, having remembered their interest. 2. This will help to add to the enjoyment because a flight lesson isn’t an over-the-top extremely difficult thing to do, it allows for relaxation and enjoyment. Again, remember, smile! If you have fun, they will have fun! If the first timer does exceptionally well, or even close, be sure to point out that they are a natural and show them, something more advanced they can master on just their second lesson (steep turns)… Your goal after all is to convert the demo flyer to a regular customer. Here is where Matt and “old school,” fly by the seat of your pants flight instructors tend to diverge. Learning to fly has to be fun, it has to be. 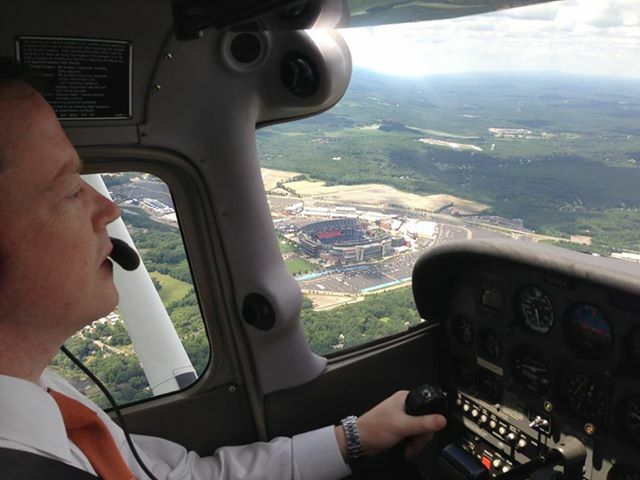 Think about it, all student pilots are learning to fly for one of two reasons: 1. They desire to have a career as a pilot or in aviation or 2. They are doing it as a hobby… That is it, the only two reasons someone pursues a pilot certificate, now within those categories their can be subsets like the student every CFI dreads, the students forced to take lessons so that a family member can live vicariously through them… But I digress, that’s a topic for another day. As a flight instructor you are really more of a life coach than anything else. Chances are piloting an airplane is the most demanding, exciting and difficult (to initially learn) skill that any of your students will face in their life. I can recall from high school students to executives, learning to fly was always the greatest challenge for my students. For those students that stuck with it, in the end it was a great accomplishment for them. 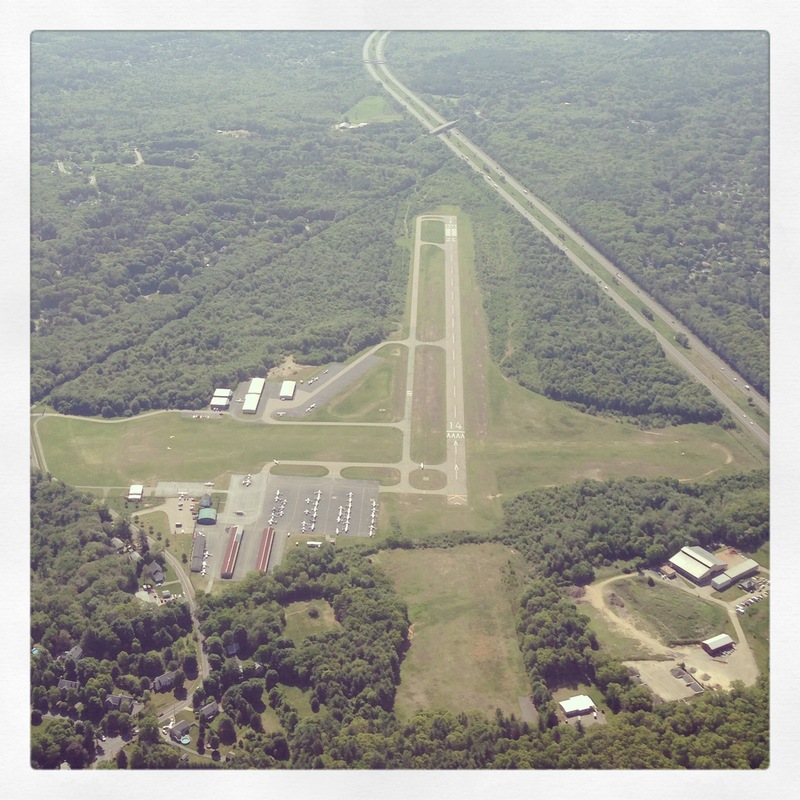 This aerial I shot in 2014 shows the relative closeness of the Mansfield Airport and Route 495! 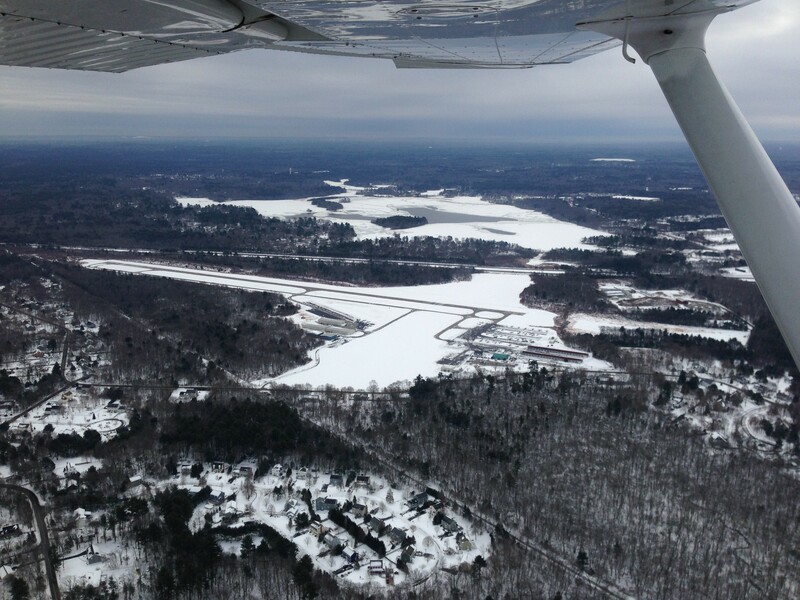 This wintertime picture shows 1B9 in the foreground and the Norton Reservoir (completed with its islands) on the far side of Route 495. Again, over time each flight instructor finds their own groove, because it really is sink or swim. Some instructors are lucky to fly at flight schools where dispatchers simply match new students to the next instructor on a list, with more new students coming in each day, but this isn’t the norm for most flight schools. At the majority of flight schools it is up to the instructor to convert the first timer to a coveted regular customer… These are the things that worked for me… They may work for you, they may not, either way I highly recommend putting the customer first and having fun with it, not only does this make for a better first flight for the student, it makes for a more enjoyable block in your day littered with hurry up and waits, no shows and the litany of other challenges faced by flight instructors!